Wow! Tj’s Taylor Rental in Hadley and South Hadley is celebrating 20 years in business. 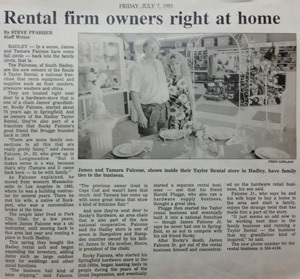 TJ's Taylor Rental opened in 1995, converted an independent rental store to its present Taylor Rental store. Tamara and Jim Falcone (owners) can hardly believe how fast the time has flown by. When they purchased the run-down Redi Rent back in 1995, they had no idea 20 years later they would be running two modern, successful rental stores and serving customers in over 20 towns and city’s through western Massachusetts. Ever since day one, we have prided ourselves in providing excellent customer service and expertise. Here at TJ's, we offer quality products for a reasonable price and guarantee customer satisfaction. We have it all! We carry a wide selection of rental equipment for every occasion. Whether you’re a homeowner that is looking to install new countertop, throwing a party or even planning your wedding day, we have everything you need. At TJ'S Taylor Rental you "Rent the equipment, keep the advice!" Stop in today to visit our showroom for new ideas! We look forward to seeing you soon!